The beauty of this armored warfare simulation is that it can be played from the simplest action mode to the most complex operational level of company command. You may choose to command only your particular tank or as many as 20 tanks, artillery and aircraft, while the battle rages around you with up to 40 total vehicles on the battlefield. Train at the army's tank school at Fort Knox before being called to battle in Central Europe or the Middle East. 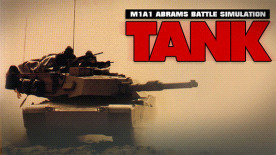 Multiple views from inside the tank, the authentic weapons systems and instrumentation, plus the spectacular graphics and rolling terrain combine to provide realism at its best. The fifteen challenging missions will satisfy even the most avid tankers. Call for reconnaissance planes and ground support when you encounter perilous situations as the Soviets send their best T-80 tanks, artillery and Frogfoot aircraft to halt your offensive. It's a fight to the finish. To the victor go the spoils! ‌- Extremely large battlefield area (3 maps each containing over 600,000 acres)"